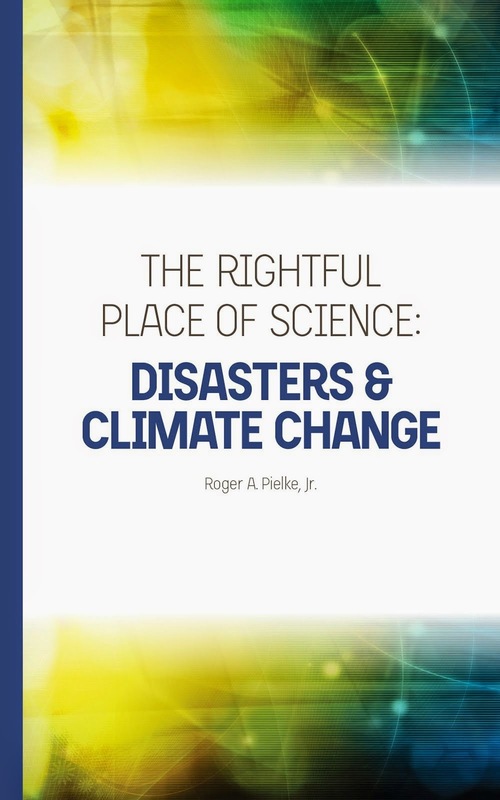 Roger Pielke Jr.'s Blog: Is it Science or Is it Politics? Real Climate offers a rather muddled take on the controversial PNAS paper published earlier this week, which helps to shed some light on the thinking behind the paper, and how questions of science are conflated with questions of politics. So, do the climate scientists who have publicly declared that they are ‘convinced of the evidence’ that emission policies are required have more credentials and expertise than the signers of statements declaring the opposite? We provide a broad assessment of the relative credibility of researchers convinced by the evidence (CE) of ACC [anthropogenic climate change] and those unconvinced by the evidence (UE) of ACC. . . We defined CE researchers as those who signed statements broadly agreeing with or directly endorsing the primary tenets of the IPCC Fourth Assessmentthat it is “very likely” that anthropogenic greenhouse gases have been responsible for “most” of the “unequivocal” warming of the Earth’s average global temperature in the second half of the 20th century . . .
. . . as tests of political preferences, these [sign-on] letters are probably valid indicators. I would not even go that far, as I have documented, the world's most authoritative "skeptical" climate scientist (RPSr) argues strongly for a human influence on climate and the need for action, including on emissions. But for purposes of discussion, lets say that the PNAS paper has perfectly segregated two camps according to their views on climate science as it claims to have done. There is a major problem that results. I claim it is only reasonable to place IPCC authors in the "mainstream" and to recognize that the IPCC reports incorporate a strong call for action on greenhouse gas reductions. IPCC reports should be neutral with respect to policy. It cannot be both ways. Either the IPCC is a politicized body consisting only of people with a single political view on emissions, or it is policy neutral with no implications of being a contributor for a particular political agenda. If the former then the IPCC is deeply compromised and biased and if the latter then the PNAS paper is built on a flawed assumption. Is the PNAS list about views on science or politics? I don't think that even Real Climate would go so far as to say that one's views of climate science dictate one's views on climate politics, given the diversity of opinion on both. This gets to the nub of the problem of blog and media wars over climate science. These debates are in fact entirely political (if you actually want to debate science there is a peer-reviewed literature for that). These debates are about what we should do on climate change and who should have authority to speak and decide. But in democratic politics you get to participate no matter how many papers you have written, how stupid your views are and how inane your policy recommendations (e.g., they even let cap-and-trade advocates participate, but I digress;-). The problem with the PNAS black list is that it seeks to use a metric of scientific credibility to establish authority in political debates and thus to delegitimize a group of people in political and public debate. In the real world, action on climate change will occur via compromise via traditional democratic processes. It will not occur because some small group of elites have been judged to be the wisest men (and women) of all and the others relegated to irrelevancy. Such efforts to delegitimize will inevitably flounder on the realities of democracy. In politics, climate scientists have no special authority in making policy judgments. They are no more special than economists, sociologists, engineers, technologists, philosophers, priests, rabbis and other experts and specialists. In fact, they have no special authority beyond non-specialists like Marc Morano or Joe Romm. They are experts, who have knowledge that is useful and even necessary in policy making, but this confers no special authority in the political process. Military historians or tacticians don't get to decide how wars are fought and academic economists don't decide economic policy -- they are important to consult of course. Now, it is true that politicians and the public sometimes act like scientists have a special authority (and often for selfish reasons, like avoiding accountability), and of course some scientists like to act that way as well. Many activist scientists won't like to hear this. the basic consensus is almost universally accepted. That is, the planet is warming, that human activities are contributing to the greenhouse gases in the atmosphere (chiefly, but not exclusively CO2), that these changes are playing a big role in the current warming, and thus, further increases in the levels of GHGs in the atmosphere are very likely to cause further warming which could have serious impacts. You can go to any standard meeting or workshop, browse the abstracts, look at any assessment, ask any of the National Academies etc. and receive the same answer. There are certainly disputes about more detailed or specific issues (as there is in any scientific field), and lots of research continues to improve our quantitative understanding of the system, but the basic issues (as outlined above) are very widely (though not universally) accepted. They are right. And I would bet that many on the PNAS black list would also agree with this point of view. Had the PNAS paper been about science, it might have actually tested this proposition. But why would it? There is little need to test scientific opinion because there is such a broad consensus on exactly these questions. In fact, most of the US and global public also agrees with this point of view. As I have argued, insofar as climate policy is concerned the science debate is over. Does this mean that everyone agrees on everything or that we won't make new discoveries in the future? No, of course not. What it does mean is that further public debates over climate science offer precious little to advancing climate policies, but do offer great potential for harm within the scientific community. Equating science with politics in an effort to give a small set of scientists an upper hand in political debates will do far more to politicize science than to usher in an era of authoritarian policy making on climate change by a few scientists. Sorry guys, but that's politics.